61 episodes of Tech Done Right since the first episode, which aired on January 4th, 2017. Ruby is great. But it's not the best tool for everything. On this episode, I talk to James Edward Gray II and Steve Klabnik. Both James and Steve have made substantial contributions to the Ruby and Rails community, and they now both spend lots of time using other languages. We talk about what makes Rust and Elixir interesting for Ruby developers to learn, what some other interesting languages might be. Presenting a technical talk can be an important part of a developer's career. In this episode, we're talking about how to perform a technical talk with Saron Yitbarek. Saron runs the CodeNewbie Podcast, and others, and organizes and coaches speakers for the Codeland Conference. Saron and I both have some thoughts and opinions about how to deliver a good technical talk. This episode has a lot of tips about how to prepare, what to do at the start of a talk, how to engage the audience, and why emoji are better for slides than videos? We'll give advice on how to give the talk that only you can give and how to get the best performance that you can. What is an apprenticeship program, how is it different from an internship, and how can your company benefit from having one? In this episode, we’re talking about technical apprenticeships with Megan Tiu of Women Who Code. Megan and I have both run apprenticeships at various companies. We’re also joined by Table XI’s current apprentice cohort, Kara Carrell and Alyssa Ramsey. What can a small company do to improve its diversity and inclusion practices when your company just isn't changing personnel quickly enough to improve via hiring? Here to discuss this are Meara Charnetzki from Table XI, Michael Donnelly from the FWD Collective and Elena Valentine from Skill Scout. We'll talk all about company values, supporting a wider community, using internal feedback, and what to do to encourage improvement at your company. I've been attending technical conferences for years, and I've always wondered about the hidden challenges involved in putting a conference together. In this show, four of the best conference organizers I know join me to share their secrets and stories. Marty Haught, organizer of many conferences including RubyConf and RailsConf, Jen Remsik and Jim Remsik, who organize the Madison+ family of conferences, and Leah Silber, who organizes EmberConf and RustConf. Learn about budgets, picking talks, and managing facilities and vendors. Tech Done Right is looking at onboarding from both sides. In this episode we talk with Shay Howe and John Gore about onboarding from the company side. We talk about what a new company can do to set a new employee up to be successful and how best to structure that support. How can you best give feedback? What are common onboarding mistakes? Tech Done Right is looking at onboarding from both sides. In this episode we talk with Katie Gore and Elizabeth Trepkowski Hodos about onboarding from the employee side. What can you do as a new employee to navigate the culture and environment of a new workplace? What are useful strategies? And what are some problems to watch out for? What does AI mean for the future of design, development? Can I be replaced by an AI algorithm? Today, we talk to Zach Pousman, from the consultancy Helpfully. Zach thinks a lot about artificial intelligence and how it might impact the future of different knowledge work. It's impossible to talk about AI without talking about the ethics of AI projects and how AI might affect the larger society. We'll talk about why AI started with chess and moved to facial recognition, what AI might and might not be able to do in the future, how we might deal with it, and how that will change the way you work. I'm back in the testing weeds with Sam Phippen, lead maintainer for RSpec-Rails, and Justin Searls, co-founder of Test Double and author of testdouble.js. We talk about long-running test suites: are they bad, or just misunderstood? Does parallel CI solve all testing speed problems, or just some of them? Then we move to a wider view, what does it mean to test your library as part of a larger ecosystem. And, how can we leverage coverage or CI information to make for more useful testing tools over the lifetime of a project. After many attempts at cross-platform mobile application tools, React Native seems to be the real deal, easy to use, powerful tools, and native look and feel. 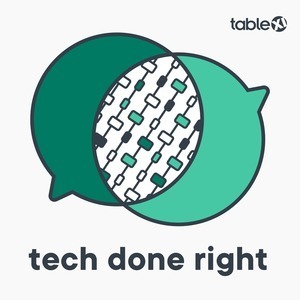 On this show, Ed LaFoy, Table XI's Director of Mobile Development, is joined by two longtime members of the React Native community: Gant Laborde of Infinite Red and Brent Vatne of Expo. We talk about why React Native succeeds, and how to be successful using it, and also give some resources for people who want to get started. How can you take an idea, find a development team to realize your vision, and then improve it? And once the vision is realized, how do you get people to find the product? Serial entrepreneur and digital marketing expert Neil Patel joins Tech Done Right to talk about his process for repeatably going from idea to product. How do you design for both doctors and patients, two very different audiences that need the same data? If you are designing health care technology, how do you build the trust that lets users know it's okay to share sensitive medical data, such as full-body skin images? Kyoko Crawford, CEO of SkinIO, joins Mark Yoon of Table XI on the show to talk about the challenges of health care technology, and how empathy is always important in the end. Have you ever wondered what it's like to work with a software team? Perhaps you are a developer wondering what you seem like from the outside? Or maybe you are starting to work with a software team and you want to know what to expect? Cat de Merode and Matt McNamara join the show to talk about their experiences as product owners interacting with developer teams. We'll talk about what developers can do to build trust, how to work with product owners on estimates and to talk about technical topics. And they'll say what the most important things developers should know about working with their product owners. What's it like to run an Open Source project as part of your day job? How does open source change when it's backed by a company? Why is it useful for a company to run open source projects? Nell Shamrell-Harrington, who runs the Habitat project for Chef is on the show to talk about open source contributing and maintenance. You'll come away with some ways to be a better contributor and maintainer.